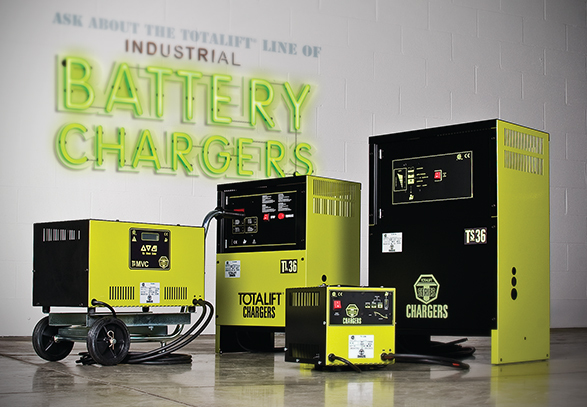 The TOTALIFT TLX is a fully automatic 100% Opportunity Charger with an Exclusive Automated Dual Rate Charging Curve. The operation of the TLX charger is managed by the new MTL3 Digital Charger Controller, which has a fully programmable microprocessor based electronic control board. This small, fully automatic, high frequency charger is waterproof and extremely resistant thanks to it’s monobloc aluminum casing and circuits in an epoxy resin cast. Ideal for installations on vehicles where space is limited or the charger is exposed to chemicals, dust, or bad weather. Monitoring the state of charge is simple thanks to the 3 LED indicators & active circuit protects the charger from polarity inversion, overload and short circuit of the battery & overheating of the unit. Despite it’s small size, it can charge batteries from 30Ah to 240Ah in 8hours depending on output voltage. The charge curve can be programmed for any type of battery. Due to it’s air cooling system it can operate at stable temperatures regardless of the position or orientation it’s installed. An active circuit that protects the charger from polarity inversion, overload and short circuit of the battery and overheating of the unit. The TLHF2 can be bundled with an external state of charge indicator or a charge management module.